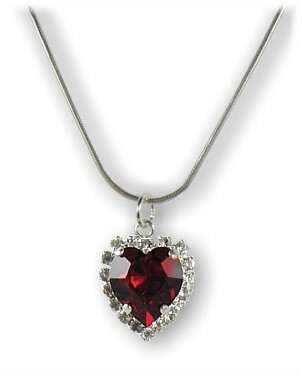 It's hard to imagine a more romantic or dramatic statement of love than this full-blooded, fire-polished ruby red Swarovski crystal heart with its shimmering border of crystal clear Swarovski crystals. Looks absolutely divine with everything from strapless dresses to jeans and a top. Includes 41cm (16") to 46cm (18") Sterling Silver snake Chain. Heart Size: 2cm x 2cm.